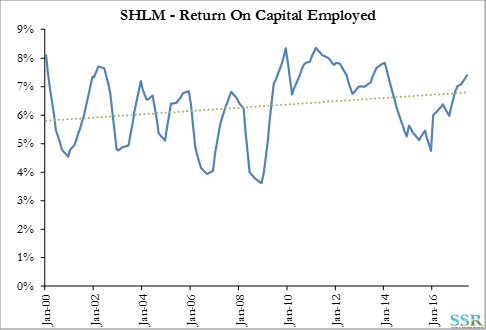 A Schulman (SHLM) and H B Fuller (FUL) missed second quarters – SHLM rose on the news, FUL fell. FUL is more expensive than SHLM, but we think there is more to the story. 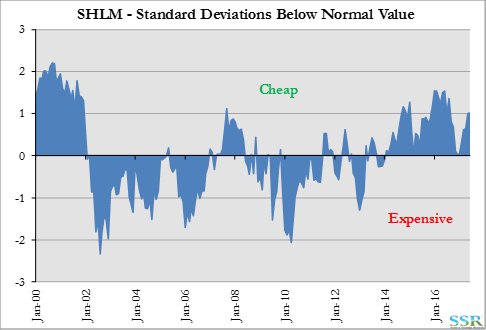 SHLM has been a serial optimist, consistently over-estimating or allowing analysts to overestimate earnings and missing or guiding down frequently. SHLM is looking for a new CEO – perhaps a chance to correct this. The transition is a year away – but valuation looks interesting enough to wait. FUL by contrast has been conservative with guidance, generally meeting or beating estimates. 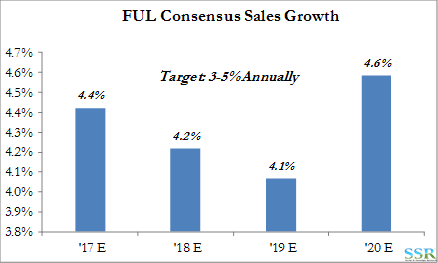 FUL announced ambitious 2020 goals in early 2016 – with lofty (optimistic) targets on returns on capital and revenue and EPS growth. So far FUL is falling short. Optimists underperform and conservative managements outperform – this is based on research we have published and updated consistently since 2012. 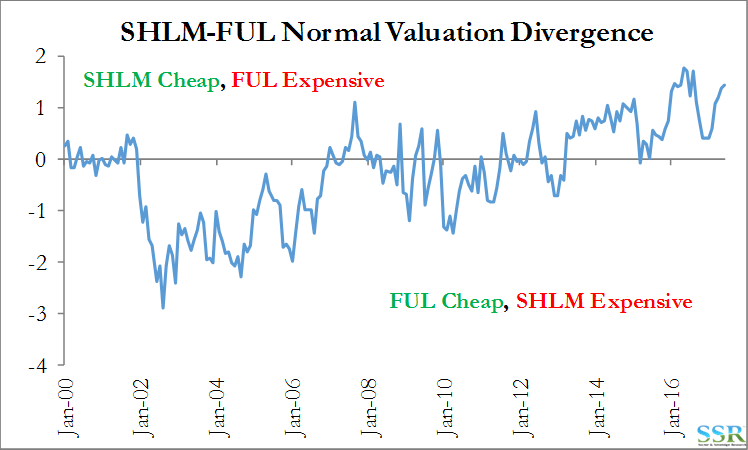 SHLM is cheap in part because of the uncertainty created by management optimism. 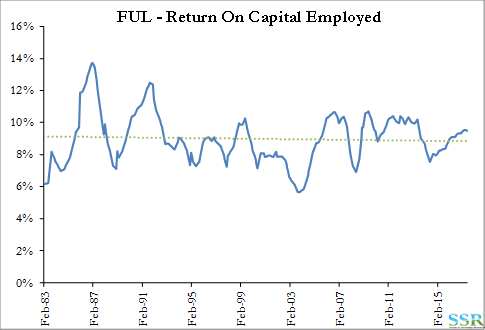 FUL is more expensive in part because it has been a safer bet. The hope reflected in SHLM’s stock move suggests that investors expect a change in leadership to be beneficial – the company does not necessarily have to do better – it may win simply by setting expectations more appropriately. By contrast, the step down in FUL may reflect a realization that the targets stated by the company are unrealistic and will have to be dialed back. One bad quarter does not make a trend, but estimates for FUL suggest that analysts covering the stock do not expect the company to meet its 2020 goals. Our advice to FUL would be to reset quickly, if that is also now the internal view, rather than start looking for ways to spend money to try and create the growth and returns targeted. This is the failed strategy that APD employed in 2012 and into 2013 – in its case lower return capital spending projects – when it looked like the stated 2015 goals were out of reach. Another approach for FUL would be a more aggressive focus on costs. 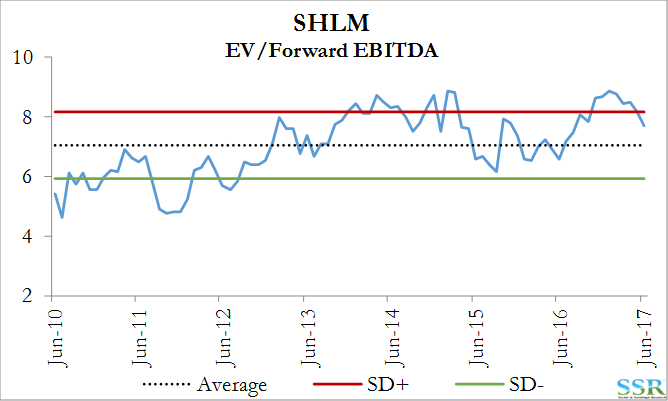 Valuation and possible positive fresh blood at SHLM with new ideas and caution in terms of setting expectations, suggests taking a look at SHLM – maybe with FUL on the short side. 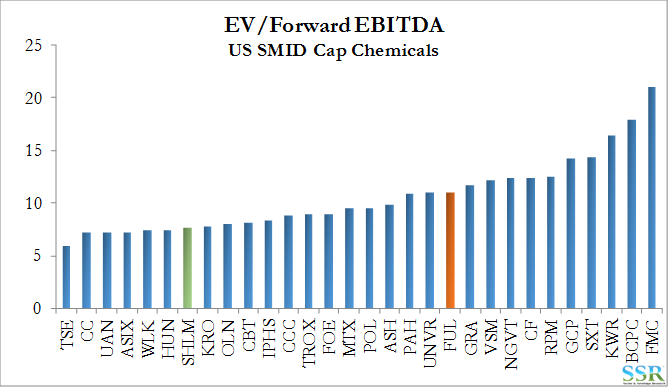 Within small/mid-cap Chemicals we still have a strong preference for TSE and VSM. A too bullish view of macro factors. Overestimating one’s competitive position – expecting to either gain or retain market share by misjudging either the competition or barriers to entry. Overestimating your ability to pull off and effectively integrate acquisitions. 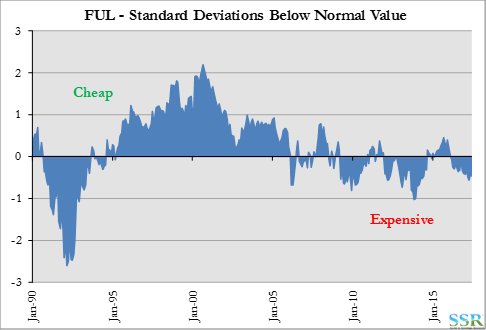 In Exhibit 2 we show the results of our work across the broader Industrials and Materials space where we looked at the performance of the 20 most optimistic companies versus the 20 most conservative (out of a total of around 100). Optimists are measured by how much they overestimate annual earnings in either implicit or explicit guidance over a long time frame. Companies can switch from one group to another but this generally requires management, or as we prefer to call it “regime” change. Air Products was an optimist until the CEO change in 2013 (it may be becoming an optimist again because of some lofty expectations for the next couple of years). Dow Chemical and DuPont were both consistent optimists – for DuPont we have seen a change since Ed Breen took charge – for Dow the change came with Third Point’s activism. As shown in Exhibit 1, SHLM has been an optimist and FUL the opposite. 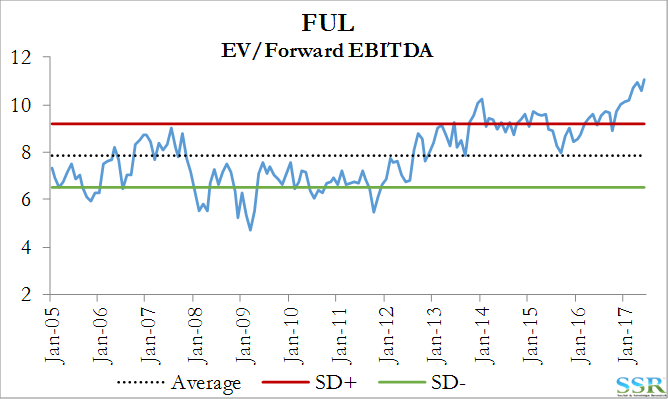 It is unclear what caused FUL to put forward such stretch targets in 2016, but they look like a bridge too far – consensus has revenues within the guided range – Exhibit 3 – but both EPS growth and margin estimates fall short of guidance. 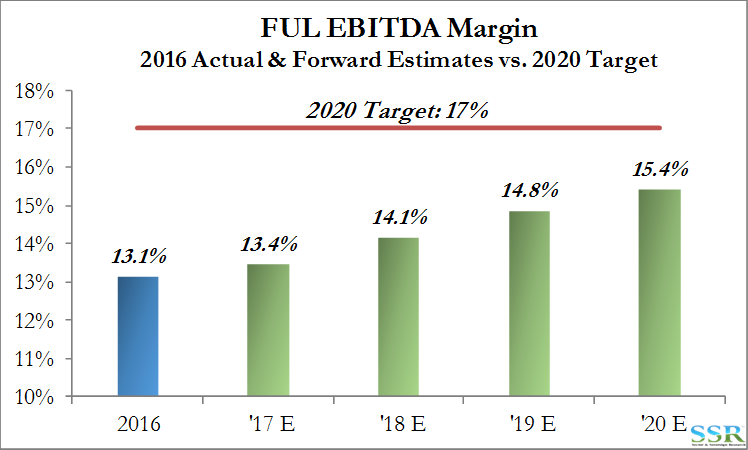 Exhibit 4 shows expected EBITDA margins versus the 2020 target. 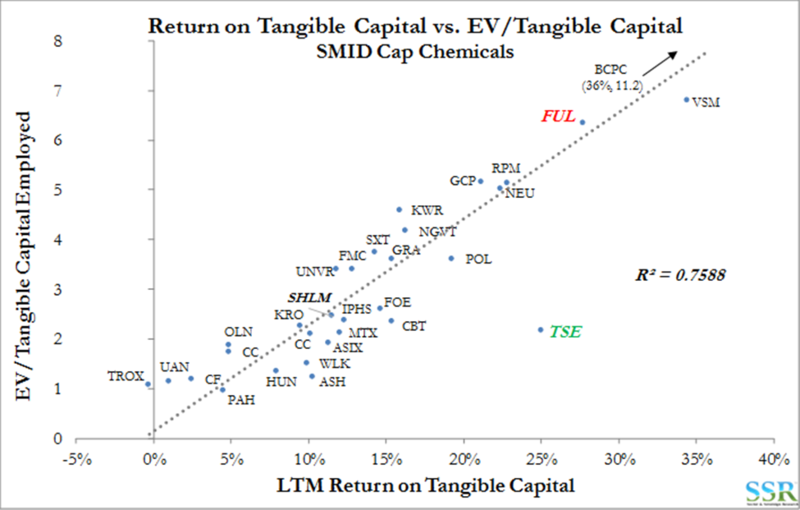 Despite the positive conclusions on SHLM – much of which is confirmed in the valuation charts below – either as a stand-alone story or paired against FUL, we still prefer TSE in the smaller-cap chemicals space as we think valuation remains compelling and see minimal near-term risk to styrene fundamentals – Exhibit 5.